Forty years ago Trevor Francis became Britain's first £1m footballer when he moved to Nottingham Forest, who went on to win the European Cup that year. Sputnik looks at the players whose moves broke transfer records. On 9 February 1979 Nottingham Forest, managed by the eccentric and egotistical Brian Clough, shocked the footballing world when they broke the UK transfer record by spending £1 million on striker Trevor Francis, from Birmingham City. The total cost of the deal, including tax, is actually reported to be £1,180,000. It smashed the previous record, set only the month before, when West Bromwich Albion paid Middlesbrough £516,000 for David Mills, who suffered a catalogue of injuries and scored only six goals in 59 appearances. Nowadays English Premier League clubs sometimes pay well over £1 million just to loan a player for a few months. ​But who are the players whose transfer fees have raised eyebrows? The world transfer record was smashed to smithereens in August 2017 when he moved from Spanish giants Barcelona to Qatar-funded Paris St Germain for a fee of 222 million euros (£198 million).Journalists struggled to keep a straight face as the Brazilian international spoke about his motivation for moving from one of the world's great clubs to a team which has never won the Champions' League. Neymar (Brazil) triumphs after the victory in the World Cup 1/8 finals match between Brazil and Mexico. "It's not about money," Neymar said, despite reports that he would earn 600,000 euros (£537,000) a week — which works out as £3,200 an hour. Eyes were raised even further when PSG club president, Nasser Ghanim Al-Khelaïfi, said Neymar "could have gotten even more money." Neymar has scored a phenomenal 32 goals in 33 games for PSG but has missed large parts of this season through injury. In July 2018 Portuguese star Cristiano Ronaldo moved from Real Madrid to Juventus for an eye-watering £100 million. That was a lot of money to pay for a 33-year-old. It looked an even better deal for Real when reports began to emerge only two months later that the player was being accused of sodomising a woman in Las Vegas in 2009. Ronaldo has firmly denied the claims but they have affected his form and have certainly affected sales of Juventus shirts with his name on. It was not the first big money move he had made. He moved from Manchester United to Real Madrid £80 million in 2009, giving the Old Trafford club a £68 million profit on a player who remains adored by United fans. Whether Paul Pogba will ever be adored by United fans is highly unlikely. The Frenchman was actually been discarded by United in 2012, when Sir Alex Ferguson was unable to guarantee the teenager a place in his starting line-up. He moved to Juventus in Italy and became the fulcrum of their team as they won the Serie A championship year after year. In 2016 United's new manager Jose Mourinho demanded the club reach deep in their pockets to sanction the signing of Pogba. ​After a long tug of war Juventus eventually let him go for £89 million. But his form was indifferent in his first season and he fell out big time with Mourinho at the beginning of this season, after returning from Russia where he helped France win the World Cup. There was at least one training ground row between the pair before Mourinho was finally sacked. Pogba's form has improved markably since Ole Gunnar Solskjaer took over as manager. Chinese football clubs have been throwing money around in the last two or three years and their biggest purchase was Givanildo Vieira de Sousa, better known as Hulk. In 2016 the Brazilian striker, who had just turned 30, moved from Zenit St Petersburg, where he had scored 56 goals in 97 games and became a huge favourite of the Russian fans. "Life-wise, everything was great. I enjoyed living in Russia and I adore living in China. I've made lots of Russian friends and I'm making friends in China. I think that was a good experience," he told Sputnik in July 2018 when asked to compare Russia and China. Hulk's career has never taken a traditional path. He started off in Brazilian football but played for two Japanese teams before eventually rocking up at Porto. After a prolific spell at the Portuguese club he passed up the chance to move to Spain, Italy or Britain and instead joined Zenit. Born in Peckham, one of the roughest parts of south London, as a young player Rio Ferdinand's class was obvious. He came through the ranks at West Ham, a club who also produced Frank Lampard and Joe Cole around the same time, and moved to Leeds United, then one of the top clubs in England, for £18 million in 2000. But in 2002, after an impressive World Cup for England in Japan, Ferdinand moved on to Manchester United for £30 million, then a UK record. He was one of Sir Alex Ferguson's best signings, becoming a lynchpin of United's defence and playing 312 games over the next 12 years. Newcastle-born Alan Shearer started off playing football hundreds of miles away with Southampton. The teenage Shearer scored a hat-trick on his debut for the Saints and in 1992 he was one of the first players Kenny Dalglish signed for Blackburn Rovers when the wealthy Lancashire club began plotting their assault on the Premier League. Rovers won the Premier League in 1995 and he scored 112 goals in 138 games for the club before his hometown club came in for him the following year. The UK transfer record at the time was £8.5 million at the time but Newcastle almost doubled it — paying a phenomenal £15 million to bring him to St James's Park. He was greeted like a Geordie Messiah and scored 148 goals in 303 games for the Toon, but was unable to help the perennial under-achievers win any trophies. Only three players have broken the world transfer fee record twice. Alf Common and David Jack — English players from before the Second World War — are two and the third is a diminutive genius from Buenos Aires. After a dazzling World Cup debut for Argentina in 1982, Diego Maradona appeared to be an absolute bargain when Barcelona splashed out a world record £5 million on the 21-year-old in July 1982. He scored 22 goals in 36 games for Barca but at the end of the 1984 season the headstrong 23-year-old sparked a mass brawl with Athletico Bilbao players after being taunted by the Basque club's fans and being mercilessly fouled by their brutal defender Andoni Goikoetxea. "When I saw those scenes of Maradona fighting and the chaos that followed I realized we couldn't go any further with him," said a Barcelona executive. So he was sold to Napoli in Italy for another world record — £6.9 million. Napoli went on to win Serie A in 1990 and Maradona himself won the World Cup with Argentina in 1986. He scored 81 goals in 188 games for Napoli and remains a god-like figure to the club's fans. Trevor Francis may have been the first £1 million transfer involving a British club — in 1979 — but that figure had already been splashed out by an Italian club. In 1975 Napoli — yes, them again — spent a seven figure sum on Giuseppe Savoldi, a striker with Bologna. ​He scored 55 goals in 118 appearances for Napoli as they won the Coppa Italia but he returned to Bologna in 1979. Savoldi only played for the national team four times, scoring once. In the 1960s Italian clubs began sending scouts to scour England and Wales for promising prospects who could make a mark in Serie A.
Gerry Hitchens, who had started out in life as a coal miner in Staffordshire, was a prolific striker with Aston Villa, scoring 78 goals in 132 games. 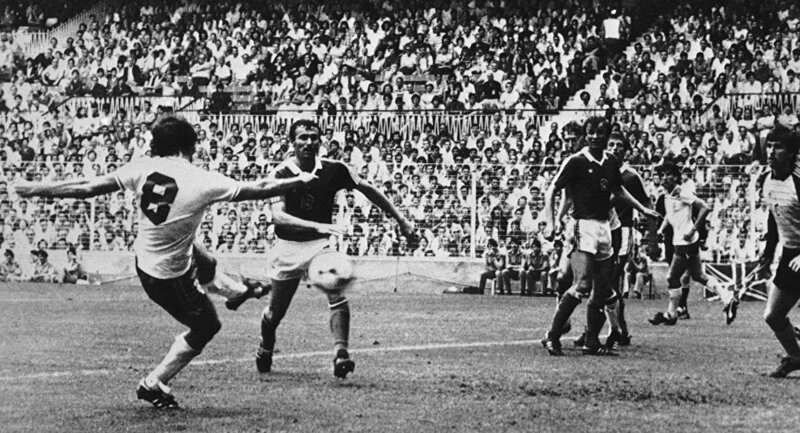 Hitchens made his England debut in 1961 and impressed when he scored twice in Rome against Italy as England won 3-2. That game brought him to the attention of Inter Milan, who signed him for a then British record of £85,000. Hitchens was a hit in Italy, scoring 16 goals in his first season with Inter and hitting five goals in seven games for England during the 1962 World Cup in Chile. He moved on to Torino and Cagliari, before returning to England in 1969. Born in the East End of London, Syd Puddefoot was a proper Cockney who scored an astonishing 102 goals in 158 games for his local team, West Ham, between 1912 and 1922. ​He spent most of the First World War working in a munitions factory but was called up towards the end of the conflict and was stationed at Bridge of Allan in Scotland, where he guested for local club Falkirk. In February 1922 when West Ham made it known they were willing to sell him, it was wee Falkirk who were at the front of the queue despite the then prohibitive price of £5,000. Falkirk fans and local businesses helped raise the money and Puddefoot repaid them with 45 goals in 113 league appearances before being sold on to Blackburn. In the late 19th century one of the best players in England was a Scotsman — inside forward Willie Groves. In 1892 he help West Bromwich Albion win the FA Cup, defeating Midlands rivals Aston Villa in the final 3-0. ​Villa decided they had to have him and began making approaches to him. West Brom reported them to the Football Association and when Groves did eventually move to Villa Park they were ordered to pay a record sum — £100 — for his services. Groves helped Villa win the league championship in 1894 but he fell out with the board over money and returned to Hibernian in his native Scotland. Despite being the first £100 footballer, Groves was not a rich man when he left the game and, after a few years of labouring in Edinburgh, died in poverty in 1908, aged just 39. He is buried in the city's Newington cemetery.